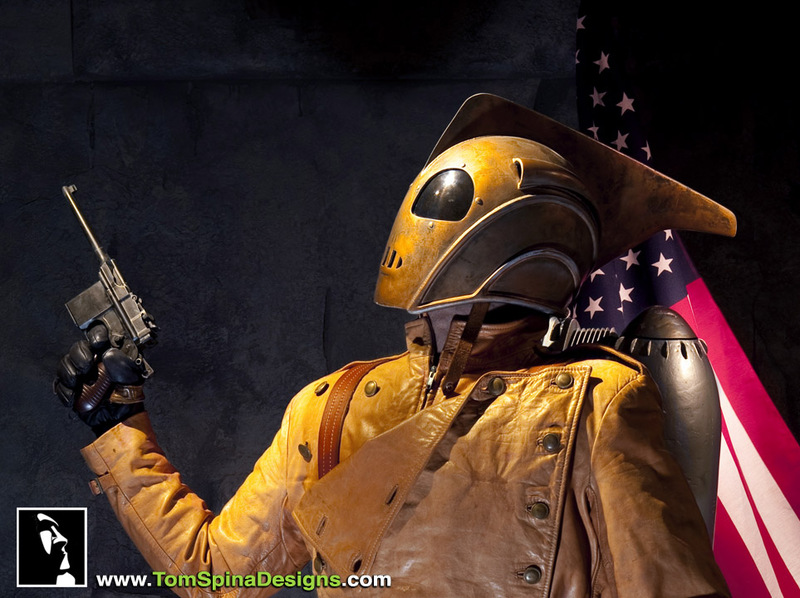 A custom mannequin and themed display created for an original Rocketeer movie costume worn in the 1991 Disney film. 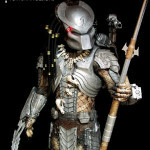 A classic film and a truly iconic costume, instantly recognizable even to people who’ve never seen the movie (and if you haven’t seen the movie, go see it now!) 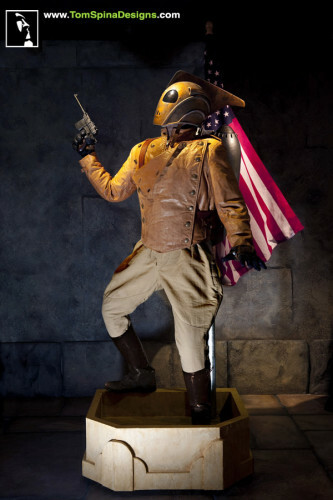 This Rocketeer movie costume consists of an original jacket, trousers, boots, hero (screen matched) helmet, rocket pack and gauntlets (the leather grips with the rocket pack ignition buttons). 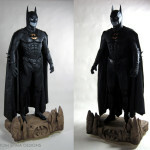 To complete the life size statue of this classic character, our studio added leather gloves and a non functional metal replica Mauser, to match the weapon shown in the comics (and in the climax of the film). 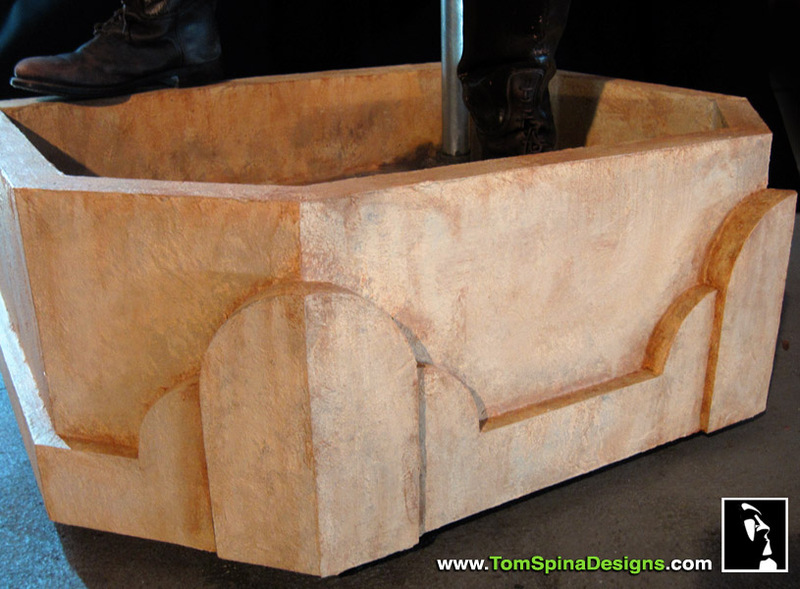 We created a custom wood base which was crafted in a style reminiscent of the movie’s sets and the 1930’s era deco architecture. It was then faux textured like stucco and weathered with browns and beiges. We added the flag backdrop to bring to mind the classic, truly iconic moment in the film when Cliff stands atop the observatory with the American flag waving behind him. A thin wire was hidden inside the flag’s edging to hold it in mid-flutter,which truly brings a moment from the film to life. 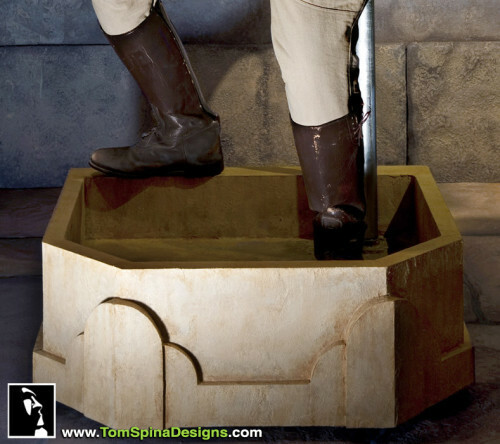 The flag pole also provided us with a sneaky way to support the statue! 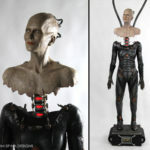 The dynamic custom mannequin’s pose was chosen to evoke the feel of both the film and the original comic art and a metal post connects the life sized statue to the flag pole to keep it stable and standing. Special thanks to Anthony Steiner for the Rocketeer’s custom wood base. 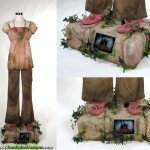 Want to turn your original movie costume into a life-sized statue or museum display? Haven't seen this sci-fi adventure classic? 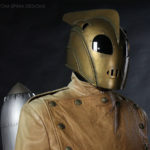 Want to see more about how we created this Rocketeer Costume mannequin?